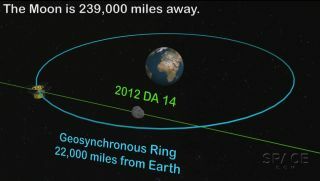 Scientists and amateur observers alike are eagerly awaiting Friday's historic flyby of asteroid 2012 DA14, which will zoom inside Earth's ring of geosynchronous satellites. At its nearest approach Friday (Feb. 15), the 150-foot-wide (45 meters) asteroid 2012 DA14 will be just 17,200 miles (27,000 kilometers) from Earth — the closest encounter with such a large space rock that researchers have ever known about in advance. Astronomers will take full advantage of the flyby, tracking the near-Earth asteroid with a variety of instruments to learn more about it and space rocks in general. And some well-placed skywatchers may be able to follow 2012 DA12 's path across the heavens Friday as well, weather permitting. As in real estate, the key to viewing the flyby is location, location, location. But 2012 DA14 will be visible from parts of Europe, Africa, Asia and most of Australia (where it will be just before sunrise on Saturday morning). To those who manage to get it in view, the most striking aspect will be the movement of the asteroid against the background stars, as it will move at 0.8 degrees per minute. That’s nearly twice the apparent diameter of the moon! As seen through the eyepiece of a high-power telescope, the asteroid will appear to whiz rapidly across your field of view, somewhat reminiscent of the second hand of a clock. Speaking of telescopes — you'll need some kind of optical aid to spot 2012 DA14. At its brightest, the space rock will shine at a magnitude of +7.4; under a very dark, clear sky, a person with average eyesight can see stars down to magnitude +6.5. (The higher the magnitude, the dimmer the object). So to view the asteroid, you’re going to need a good pair of binoculars, or better yet, a moderately big (6-inch or larger) telescope. Thereafter, however, 2012 DA14 will vault rapidly northward from a position in the far-southern sky roughly midway between the Southern Cross and the asterism known as the "False Cross." It will race north through the middle of Hydra and across the constellation of Crater and westernmost Virgo before passing very close to the bright star Denebola, which marks the tip of the tail of Leo (the Lion) some minutes before 3:00 p.m. EST (2000 GMT). You will need a good star atlas and accurate positions of where the asteroid will be on a minute-by-minute basis. NASA's Jet Propulsion Laboratory (JPL) in Pasadena, Calif., provides this information, via its Horizons system. Go to the Horizons Web interface at http://ssd.jpl.nasa.gov/horizons.cgi. For Target Body, type in "2012 DA14;" for Observer Location, enter your latitude and longitude; and for Time Span, select an interval of one minute (because the asteroid will be moving so fast). For Table Settings, choose Astrometric R.A. and Dec, as well as Visual Mag. Click Use Selected Settings, and then Generate Ephemeris. Now you’ll have a precise set of positions for the asteroid, custom-made for your location that you can plot on a star map or atlas. Unfortunately, by the time it gets dark over North America on Friday evening, the main show will be all but over. 2012 DA14 will have faded to about 12th magnitude — about 100 times dimmer compared to its closest approach — and it will be moving much more slowly, being positioned roughly between the Big and Little Dippers in the far-northern sky. On Oct. 28, 1937, German astronomer Karl Reinmuth (1892-1979) accidentally photographed the long trail of a fast-moving asteroid. Two nights later, this asteroid passed within 460,000 miles (740,000 km) of Earth. Reinmuth named it Hermes, after the Olympian god of boundaries and travelers. Since the vast majority of asteroids congregate in the main belt between the orbits of Mars and Jupiter, astronomers at that time felt that Hermes’ very close approach was an outstanding exception. "Astronomers of the day were somewhat biased," notes NASA’s Paul Chodas. "They had convinced themselves that collisions were too rare to consider." We have since learned, however, that asteroids make very close approaches to Earth with far greater frequency than once believed. In fact, our Earth is literally in a "celestial shooting gallery." In this past year alone, for instance, 50 known asteroids have passed within 1.2 million miles (1.9 million km) of Earth. That comes out to about one per week. And during this past year, 11 space rocks are known to have come to within less than the moon’s mean distance from Earth — about 239,000 miles (384,000 km) Six of them have passed within less than half the moon’s mean distance of 119,000 miles (191,000 km) from Earth, at an average interval of about two months. Researchers at JPL's Near-Earth Object Program Office estimate that an asteroid the size of 2012 DA14 flies this close every 40 years on average and that one will impact Earth, on average, about once every 1,200 years.